Choreographers Andrea Leine and Herijono Roebana have been exploring the border between dance and music, tradition and modernity, risk and safety. Chamber ensemble of eminent Bulgarian musicians Theodossi Spassov (kaval), Peyo Peev (gadulka), Galina Durmushliiska (traditional vocals), Dimitar Bodurov (piano, electronics, typan) and the American soprano Claron McFadden supports the 7 dancers of LeineRoebana including Golden Swan winners Tim Percent and Heather Ware. 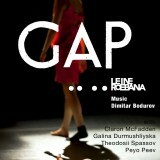 The premiere of GAP took place on the 15th of January in Chasse Theater, Breda where LeineRoebana is artist in residence. This was also the beginning of 18 shows theater tour across the Netherlands including stadsschouwburg Amsterdam, Lucient Dance Theater Den Haag, Stadsschouwburg Utrecht and Schouwburg Rotterdam among others. This project is a co-production between LeineRoabana Dance Group and Keys and Stix Foundation.